The video Obsession asks for emancipative politics through a possibility of a production of knowledge that is opposing the old persistently hidden history of colonialism of capitalism and its new forms of neocolonization. With one word, the video asks for decolonization and for decolonization of the medium of contemporary video. Contemporary video is caught in an obscene amnesia of all practices, theories and politics that were produced in the medium in the world outside of the First capitalist world. The video is based on theoretical work developed by the Argentinean theoretician Walter Mignolo, based in USA, Sarajevo theoretician Sefik Tatlic, Belgrade theoretician Ana Vujanovic, and on the French theoretician Alain Badiou’s critique of raising anti-Semitism in Europe today and the possibility to think about the signifier “Jew” for a new politics of Europe. 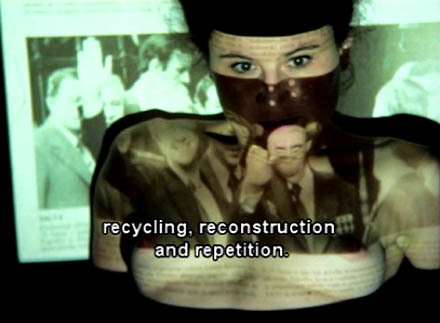 The video constructs its own new conceptual genealogy and reflects on another experimental history. This is necessary to be done today due to changes in video digital production and critical art history vocabularies. One of the questions the video raises is how to document the poverty of the video medium in relation to the condition of its production today? What means to perform a class struggle, the social antagonism that cuts through the video and connects the medium to a wider social and political stance of contemporary capitalism? collaboration with CCC/CrossCommunityCreation Institute, Ljubljana and The nstitut de Cultura de Barcelona, 2008.
received several major awards for their video productions. In 2003 a retrospective of their works (1985 – 2003) was held at the Oberhausen International short film festival, Germany. In 2004 a DVD compilation of their works from 1990s until 2003 was realized in Vienna, as part of the project INDEX.